This comic involves another Jessica convention anecdote. The Michael Bay part is me, but she has yearly run ins with the same lady not willing to part with her collection. Which is essentially what it is. She buys a both, mascarading as a vendor, and sets outrageous prices. She doesn’t want to part with it. She’s just showing it off. 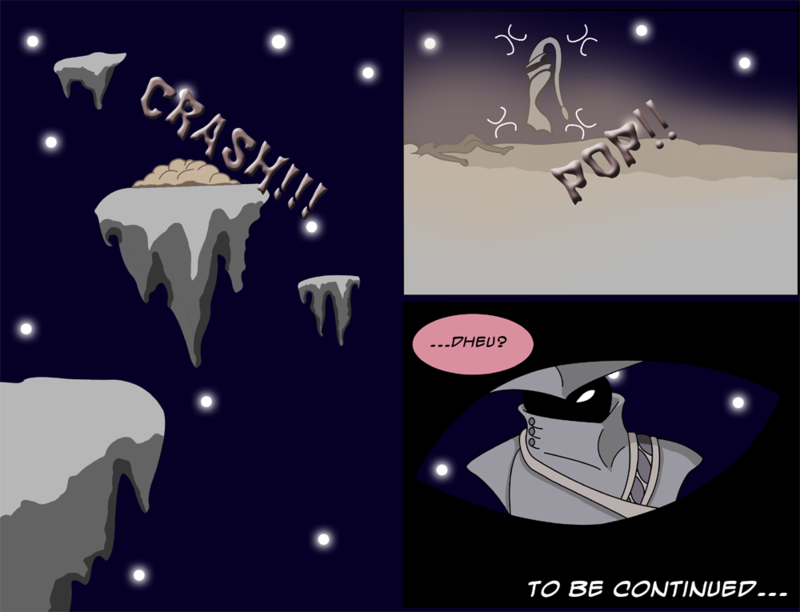 Our reader Matt has decided to make a companion comic involving what happened to Sister X after the Black Friday arc. Waiting on more, Matt. No pressure. **Also, if anyone has any special pop culturey refs you want in while we’re at a convention, speak now. I always need good ideas to throw into the backgrounds. HEY. That was Jerry Bruckheimer that nerfed Jason. Get your nerd rage right man! Platinum Dunes is Michael Bay, man. Platinum Dunes put Derek Mears in the mask, and that was the worst thing they’d ever done. I don’t think Bruckheimer had anything to do with Friday the 13th at all, really. Unless he was in on Freddy Vs. Jason, where Jason suddenly developed hydrophobia after having just walked through a lake lengthwise two or three films previous. I totally imagined you doing that while attacking Michael Bay like Goku attacked Nappa. If thats what you were going for, spot on sir. But he’s already a financial genius. He’s a millionaire, and barely has to apply himself to the plot lines in his films. He gets tons of money, and barely follows established canon of the source material. Compare that to people like Uwe Boll and Paul W. S. Anderson, and you might just notice that while those other 2 don’t really follow established canon, their movies don’t become huge blockbusters. That being said, I actually like Michael Bay’s movies. Bad Boys, The Rock, The Island, and Transformers 1 were pretty good. He may have been successful, but I feel no obligation to apply the word “genius” until he lets me take a swing at him. Possibly several swings. I’d do it for $100! Clearly I’ve gotten to used to seeing all the fat guys. She’s reached a certain ugliness level where it becomes difficult to tell. I’m reading all of her dialogue in a bass-heavy Russian accent. She and the Temple Run dude need to go for a pizza later. I saw a lady that looked like Booger from Nerds once. That is so much more scarier than hello kitty girl and temple run guy going for pizza. They are just playing in Bay’s hands. Folks have to stop watching, otherwise we are just going to get more dramatic lines from Marky Mark tryiing to sound legit when he says he just found a Transformer. She’s here on the off chance someone will pay ridiculous prices for Sanrio merch. It’s like a lottery ticket. …so Pumpkin didn’t manage to sell the $200 Final Hoodie? She didn’t manage to sell thr $200 final hoodie… YET. The price’ll go up as the end of day approaches. Nothing like the closing door of opportunity to push up demand. If Mr.Blue Were able, he’d pay her 400 To own, but get her to make more for other conventions. So, how much does a booth at a convention like this go for? I’m sure there’s some variation, but I’m talking about on average. I mean, if you are planning on going to the convention anyway, if you sell just 2 or 3 overpriced pieces you maybe break even. With anything dealing with real estate it’s all dependent on Location, Location, Location. A 10×10 in a good spot maybe 400 to 600, bigger cons more smaller cons less. (A huge con like San Diego ComiCon, a couple of thousand.) A table like Ellie is working for out beyond the Tire and Lube, couple of hundred. I’ll take ten of those tickets! Bay must pay for ruining my childhood!! Thanks for featuring!! I’ll definitely keep you updated with new stuff. It really was a nifty piece. Looking forward to finding out all the details about this odd alternate universe containing Sister X and Dheu, among possibly other things. As am I. I’m halfway wondering if they’re going to play Uno. 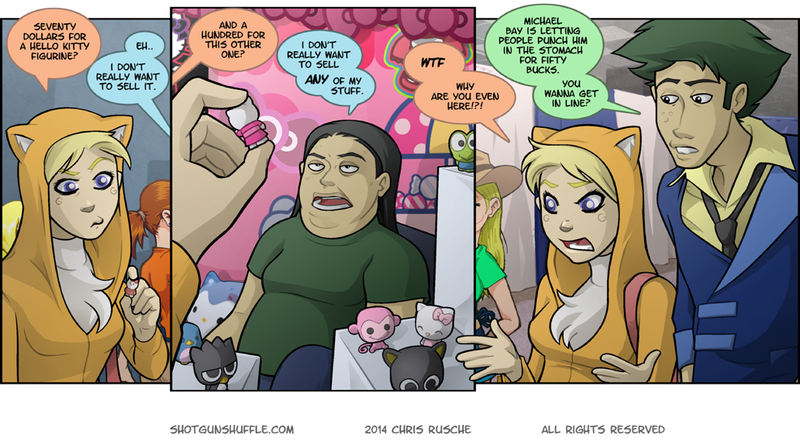 I’ve seen people like this at cons. If you just want to show off your collection, then place a sign that says display only already!!! I got my hopes up staring at that European copy of Wily Wars for the Mega Drive!!!!! If I had the opportunity to punch Michael Bay in the stomach I don’t think u would be able to stop, and honestly I don’t care about what he did to the Transformers since I’m not 5 years old anymore, the cartoon was actually quite terrible if you think back, it was just a cynical advertising move…he just seems like a real turd sandwich. Try Transformers: Prime. No, seriously. It’s really, really good stuff. I have to admit I’m not really feeling this storyline. It’s the first one since Gump Wars where I’ve felt my attention flagging. I get the con/nerd jokes/references but something feels like it’s missing. Maybe I just miss the rest of the sisters? The little gifs at the bottom of the page are cool though. Aww. Well I’ll touch on the sisters again later, but they’re not the biggest part of the comic, especially as a whole. Every storyline seems to be a base breaker of sorts. Preferences are always different since readers are here for different things. I have the Quinn-Eagan/Ellie-Blind Guy romance people, surreal storyline enthusiasts who clash with the down-to-eathicans, and so on. The sister camp is yet another faction of readers. There’s also the anti-sister faction. That’s an interesting sentiment. I’ll be honest- it makes me a little nervous. I’ve read a couple of webcomics that started out as one thing and eventually shifted away from that to something else entirely, and it rarely ended well. Now, you seem to have put a lot more long-term thought into your comic, so I’ll try to keep my cynicism in check, but I’ll be watching closely for signs that it really starts to go off the rails. You’re a motivational speaker in real life aren’t you? Wait..I’m confused, because originally the sisters weren’t part of the comic at all anyways. They didn’t get introduced until later on and now we’ve moved on from them. So technically he’s not shifting away from anything, right? That is how I see it anyways. You mean like that unholy abomination of stagnant crap that was Sinfest? I’m in a like/hate relation with the arc. I love cons. But this arc is just full of awful stereotypes and makes it seem like cons are bad full of annoying bad people. I know that’s not the intent being written but that’s how it feels to me. Seriously cons are very fun and hardly anything bad besides seeing an occasional furry occurs. That and cross dressing but usually most cross dressers have the courtesy to do it if they can pull it off and everything is cool. Then again I go to anime exclusive cons and E3 so maybe not going to a general con has allowed me to side step these kinds of things. Again love the comic still, and am still enjoying the arc. I just have these love hate moments with the current arc. Much of this is firsthand experience from myself and a few others who’ve attended conventions, so it’s a way to offer something that I’ve personally witnessed, but haven’t seen done in other medias takes on con stories. It’s also much more difficult to write a story where everyone is standing around buying merchandise and typically having a good time. That would probably be boring. So she couldn’t sell off that one she is wearing after all. Guess it is for the best. She would look weird in just that furry patch shirt. Also, I hate to be that person but Michael Bay gets too much crap in my option. He has made some pretty decent movies (well, entertaining movie and lets face it that is what I am paying $10 for anyway). Also, if the nerds hate the way he has treated their beloved series then don’t go to his movies. In another universe this is called shogunshuffle and everyone is a samurai. ahhahaha and the Seven Sisters Samurai. The story, as it turns out, is that Sailor Bubba is just a fun-loving nice dude who used to work con security, and decided to just have a little fun cross-dressing as a Sailor Scout. Strange, but hey. I actually like the Sailor Bubba cosplay. It looks immensely funny and the guy in it like he’s a fine bloke having a good time. I disagree. Please, please, PLEASE forget that one. Me and my better half would love to see some Robotech in the background. Oh, wow. There are all these neat animated GIFs on the bottom of the page now. Most kew. …how long have those gifs been at the bottom? A room filled with tvs and chairs where people played Smash Bros all day. The tabletop RPG room where frustrated GMs were getting angry because heir players couldn’t hear them try to set the mood. Local stores desperate to unload their stock buying booths. At least one person attempting to jump the rail on the ramp for people with disabilities to get to a room and failing horribly. Really lazy Cosplay, where people just put on a weird t-shirt and got upset when people couldn’t guess who they were. Yeah, my con experiences have been pretty underwhelming. Oh! How about someone dressed as Mal, raging about how Firefly was ruined by Fox? I could also see someone dressed as Profit from Profit or Ezekiel from Brimstone doing the same thing. Maybe all three of them having a Fox hatefest? Whenever I go to cons, I see a lot of trolls from the Homestuck universe. So many trolls. There are also the people that dress up as cardboard box versions of characters. Reminds me of a lot of the old TUI-based adventure games from the Long, Long Ago. Hm. I’m kind of at a loss because I encounter tons of pop culture but don’t go to cons. The only thing I can think of that’s missing (from my limited con knowledge) is someone going as something intentionally obscure/unpopular for the geek cred of it. Like someone going as Vash, but wearing a black version of his coat to match that Todd Macfarlan action figure that clashed with the series. You know, so they could correct the people trying to correct them. did i miss the super mario bros. cosplayers? or the street fighters? how could i forget RvB? $50? What a bargain! I’m gonna get in line twice! ok….NOW I know I’ve been out of the Sonic gaming world for awhile now….where is that Tails gif at the bottom of the page from? Let’s get Dr. Cube involved in this! I wouldn’t mind seeing some BlazBlue, Disgaea, or Chibi Vampire references. Oh or maybe some RWBY as well. Hey Rusche, I know it’s kind of late to ask about this, but whenever the speech bubble above Pumpkin or Ellie says “WTF,” are they actually saying the words, or just the acronym? Soon she, like the rest of us, will all talk in emoji. It’s up to the reader, honestly. This same kind of bologna is what drives me bananas about the show Pickers. It should just be called ‘Junk Hoarders’, because a good portion of them don’t even want to sell anything. I just really want a Tails Jacket now…. Klingons….. there are always Klingons. Homestar Runner reference! Go Go Go! The Gneech would love that. Deadpool! There is almost always a Deadpool at conventions! There is always, ALWAYS the group of people hidden away in some corner of the con doing photo-shoots for something that couldn’t get space. Stuff like Persona or other well-known but semi cult games. Hello? Spike? Spike, dammit! Anyone? Buehler? how can I be the only one who noticed? I’d pay Michael Bay the $50, walk up to him, then shake his hand (instead of punching him) for telling it to Hugo Weaving. You need convention cliques? Ok, two things that I run into yearly at Sc comic con. 1) Convention etiquette. Big thing here. I have always been taught that you can’t take pictures of or with people until either you or your friends has a picture taken with them by someone else. It sounds weird but it’s true. 2) Every year I meet this guy dressed as a marvel or DC character. Every year, his costume involves his reaching into an odd position. For example, this year, in order to take off his war machine cosplay, he had to look like he was digging into his crotch. Last year he had to ask someone to help take off his iron man helmet because he couldn’t reach the place where it hooked on. Just stuff like that. It’s hilarious and really awkward. You should throw in Carlos the scientist from Welcome to Night Vale. Oh! And have Waldo photobombing! It’s a classic! Just wanted to share one of my favorite con memories. Me and some friends went to a comic con in Boston about 10 years ago. Billy Dee Williams was there for an autograph session and earlier in the day I had purchased a “Lando” porcelain figurine to get autographed. After a long line it was my turn to meet him and get his autograph. He had never seen that particular figurine before and asked if I wanted him to sign on the box or the figurine. I said which ever he would prefer and he decided to sign the figurine (I think he wanted to see it too). So he opened the box and took out the little figurine and was like “Wow, that is the fattest Lando I have ever seen!” The figure looked nothing like it did on the box and it really was like a Pilsbury dough-boy Lando. It was hilarious! He chuckled signed it and now I have a signed fat Lando figurine in my collection! As for refs…well, how about Kodai/Derek Wildstar? We need someone dressed as Haruko Haruhara (FLCL – Fooly Cooly).